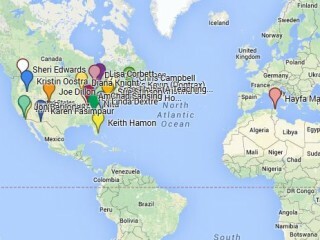 the registration for the Jan-Mar 2013 ETMOOC a map was created showing where participants are located. http://etmooc.org/blog/2013/01/05/visualization-of-registration/ A similar map could be made showing CLMOOC participants during upcoming activities. The ETMOOC map was made by uploading an excel spreadsheet into http://www.mapalist.com. However, a Google map could also be created if someone knows how to do that. I think that during upcoming discussions many uses of maps will be shared. I learned about this when I registered for www.etmooc.org. However, I’ve been engaged with mapping for nearly 20 years.